The fact that iPhone owners spend more money on average on apps, compared to Android users, is not news. A new survey conducted by Creative Strategies reveals details about where the differences between the two groups lie. It gathered the opinions of 800 people, selected to adequately represent important statistical groups. 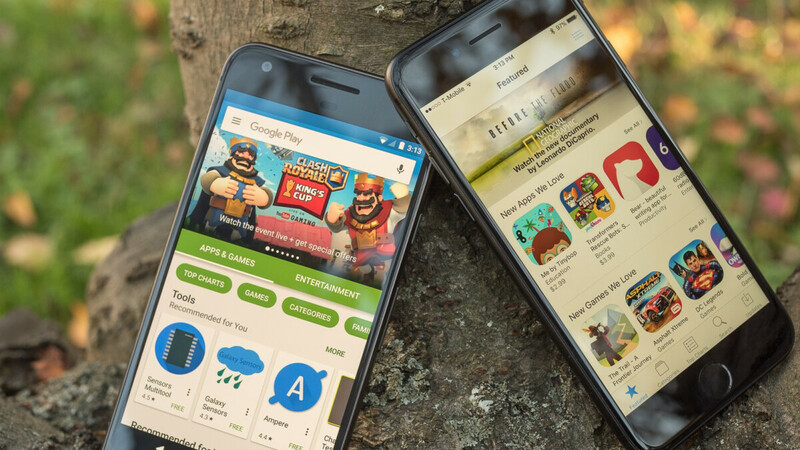 The questions follow the natural process one would go through when using app stores and start with how often users open the dedicated store app on their devices. Among iOS users, 20% said they check the App Store daily and 32% do it weekly, while only 9% of Android users visit the Play Store daily and 21% on a weekly basis. One likely explanation for the difference is that all iPhones are released with high-end components and can run apps similarly. Meanwhile, many Android phones are in the budget segment and users can't take full advantage of the app diversity, so they're less likely to frequent the Play Store. Whenever people do look for an app, however, only around 17% of users on both platforms rely on the integrated search function as a primary tool to find the right one. When using it, roughly a third of all users find what they were looking for, but most of them admit that using internet search engines gives better results. No wonder then that Google is using AI to give people personalized app recommendations. Now that users have found what they were looking for, it comes time to decide whether to download it or if it's worth the price. There is some discrepancy between how people choose what app to install. For Android users, the most important factor, at 44%, are the reviews, while 38% of iOS users say that the features are the leading driver. For paid apps both groups agree that price is the most important factor. Most users have a preset amount of money they are willing to pay for an app and additional factors like features and excellent reviews are unlikely to sway them to buy a more expensive app. Sneaky in-app purchases don't seem to be a big problem with 56% of iOS and 64% of Android panelists saying that they were clearly informed of them. Users of both operating systems largely (54% iOS and 47% Android) prefer one-time payments instead of a subscription. 38% of the Android panelists pay for the luxury of not seeing in-app ads, 8% less than iOS panelists. Probably the biggest difference when it comes to paid apps is how many of them users have. Almost half (45%) of the questioned iPhone owners said they have 5 or more paid apps or subscriptions, while for Android owners that number was only 19%. These results are not surprising, considering that iPhones are expensive devices and their owners can often afford to spend some extra on apps. Paying $5 for an app when your phone costs $200 seems a lot more than if you've spent $1000 for it. This also makes iPhone users less likely to switch to Android since they have invested more into Apple's ecosystem. If they are getting better quality apps for their money is another matter. Well Well Well... What do we have here? Where is everyone, lets all have a nice civil discussion involving iOS and Android. This isn't very informative since we are discussing two different OS and two different stores. For example a friend wanted me to try a diet and use an app to track my progress. The app my friends use is in the App store for purchase. With Google Play store I found a similar app for free with in app purchases called MyPlate from Live Strong. There are also apps in both stores where you pay on iOS but get for free with in app purchases on Android.